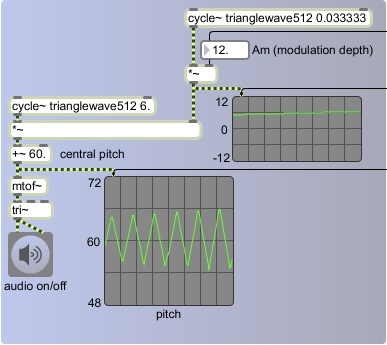 Classic waveforms can be used to shape music synthesis, and that idea can be extended to shape musical composition with simple, recognizable, repeating shapes. Indeed, many figures that we think of as traditional pitch patterns in pre-electronic music have a direct correlation with those classic waveforms. The picture below exemplifies simple melodic patterns in traditional notation that could be achieved with discrete sampling of classic waveforms at low frequency, used to control the pitch of a carrier sound. You can probably imagine many other similar melodic shapes that are similarly simple yet effective. These examples show clearly how a melody can be thought of as pitch modulation by a control function, and the shape can be simple, as in most of these examples, or more complex, as in example 8 above. Sometimes more interesting effects can be achieved by using using these shapes operating at different formal levels at the same time, or with one shape modulating another as in example 7 above. The triangle function, while decidedly not the most interesting shape imaginable, is particularly recognizable, and therefore is good for exemplifying these principles clearly. 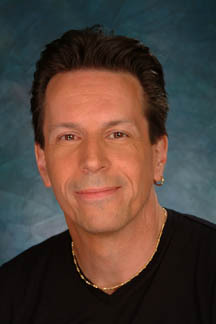 So we'll use it in a variety of examples for shaping sound synthesis and composition, focusing particularly on modulating one control function with a lower-frequency version of itself, which is to say, shaping the sound at a different formal levels, by means of self-similar use of a single shape. The modulating oscillator has a rate of 3 Hz, so the pitch of the carrier oscillator completes 3 cycles of the triangular shape per second. Since the amplitude of the cycle~ object is 1, the pitch fluctuates + and - 1 semitone around the central pitch of 60 (middle C). We'll call the rate of modulation Fm (pronounced "F sub m", meaning the frequency of the modulator), which is 3 Hz in this case, and we'll call the depth of modulation Am (pronounced "A sub m", meaning the amplitude of the modulator), which is constant at 1 in this case. We can vary the pitch modulation over a longer period of time by modulating Fm and/or Am with an even slower oscillator. For example, in the program below we use one very-low-frequency oscillator to modulate the amplitude of a low-frequency oscillator that is modulating the pitch of the carrier oscillator. We have set Fm to a constant of 6 Hz, but Am is modulated by another oscillator with a rate of 1/30 Hz and an amplitude of 12. So every 30 seconds the depth of the "vibrato" changes, according to the triangle wave function, from 0 semitones to 12, to 0 to -12 and back to 0. You probably won't recognize the difference between a vibrato depth of + and - 12 semitones and its inverse, + or - -12 semitones, so in effect the vibrato seems to complete a full cycle of expansion and contraction once every 15 seconds. So the pitch modulation, with a rate of 6 Hz, is itself modulated in amplitude repeatedly every 15 seconds. 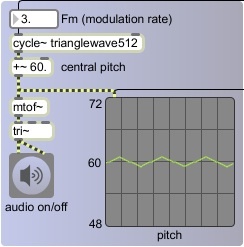 This is a simple case of a a modulator modulating a modulator.